Cranberry Bliss Bars Recipe (VIDEO) - Let the Baking Begin! 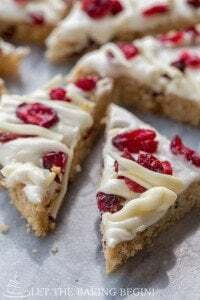 Cranberry Bliss Bars have Blondie Base layer, which is generously speckled with white chocolate chunks and dried cranberries, then topped with orange flavored cream cheese frosting, sprinkled with more cranberries white chocolate drizzle. Cranberry Bliss Bar is one of those treats that is synonymous with the holiday season in our house. 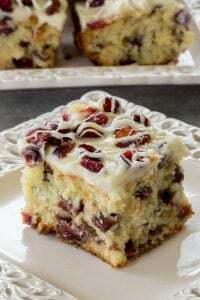 They’re made with a blondie base layer, which is generously speckled with white chocolate chunks and dried cranberries, then topped with orange flavored cream cheese frosting, sprinkled with more cranberries and lastly, drizzled with more white chocolate. A simple treat, but oh so dangerous! It’s just too easy to eat too many, way too fast! My friend has shared the recipe for these bars with me over 8 years ago and over the years I have made lots and lots of batches of these Cranberry Bliss Bars. As I have been making them I realized that I make them with some deviations from that original recipe and this time I decided to make a video (my second one now, WHOOHOO!!) of the recipe, just the way I like to make them. 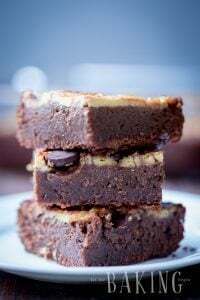 The changes that I made with these were, to bake them in a tad smaller baking sheet, which makes the bars a little thicker. Also, I have increased the cream cheese amount and decreased the powdered sugar amount in the frosting. This makes the frosting/glaze take a little longer to become not tacky. So for me, if I bake them today, they’re the best flavor and texture profile only tomorrow, which makes it a perfect make-ahead treat. (I did not wait until next day to take pictures, that’s why they’re not as perfectly cut as they would’ve been next day, so forgive me for that 😀 ). Also, I have soaked the cranberries in warm water for just a little. This makes them plumper, which not only makes the bars better but also prolongs the freshness of the bars since they give off that moisture as the bars sit. If you like this recipe, check out this Cranberry Bliss Coffee Cake as well! Cheesecake Fold Cookies – Simple cookies with a cheesecake center. Poppy seed Pastry Buns – The best poppy seed dessert. Lemon Madelines – Great lemon cookies. Cranberry Bliss Bar- Blondie base layer, which is generously speckled with white chocolate chunks and dried cranberries, then topped with orange flavored cream cheese frosting, sprinkled with more cranberries white chocolate drizzle. Preheat oven to 350F with the rack in the middle. Line a 9x13 inch baking pan with foil or parchment paper. Set aside. Cream together 1 1/4 cups brown sugar, 1/2 tsp salt & 3/4 cup butter until smooth. Add eggs & vanilla extract, one egg at a time creaming the mixture in between. Add 1 tsp ground ginger, 1 1/2 cups flour & 1/2 tsp baking powder and mix everything together. Add 1 cup dried cranberries & 4 oz of chopped white chocolate and fold them in. Using wet hands or wet spatula spread the batter evenly in a 9"x13" inch baking pan. Bake for about 15 minutes or until the middle is puffed up and baked through. I like my bars to be more on the goey side (like a good chocolate chip cookie) so I do not bake the base layer too much. Do not overbake or the bars will be very dry. Allow to cool. Add 6 oz of cream cheese, 1 cup powdered sugar, 4 tsp lemon juice & 1 tsp vanilla extract to a bowl of a mixer. Using a beater or a whip attachment beat/whip everything together until creamy, about 3 minutes. Place the white chocolate in a cup and microwave for about 40-50 seconds in 7-8 increments stirring with a spoon in between, until it just starts to melt. Continue stirring until all chocolate is melted. Do not overheat the white chocolate or it will turn hard and become unusable. Spread the cream cheese frosting over the cooled down crust. Sprinkle the dried cranberries on top. Drizzle melted white chocolate on top using a fork. Allow the bars to set until the top of the cream cheese frosting is not sticky to the touch, several hours or next day. This will make it easier to cut the bars. Trim the ends of the bars, for even edges. Cut the bars into squares, then cut the squares diagonally into triangles. Store at room temperature or in the refrigerator. If you would like to see my other Cranberry Bliss Recipes CLICK pictures below. Hi I just wanted to know what brand of white chocolate chips do you use? Mine never melt they just burn. I use Guittard. I wonder if you’re overbaking the cake itself? The white chocolate chips are not the best for melting, but even other brands I used don’t get dark when baked in the cake if the cake isn’t overbaked. I don’t know, just an idea? Hi, first time visitor here. The former Bliss bar was too salty and I was soooo HaPpY that Starbucks had changed their recipe so here I am on a “quest” sorta, to get the framework of the recipe and alter where I need to. For this new Bliss Bar, I immediately noticed they used ginger. However, not ginger powder. Instead, Starbucks used verrrrry finely chopped pieces of “candied ginger” (much better than powdered ginger). Candied ginger is sold at Trader Joe’s, natural food stores and in spice jars by Spice Island I believe. Starbucks also used dried cranberries that were fortified with Sunflower oil and therefore the cranberries were nice and soft — and shiny and very flavorful. In addition, what I thought was white chocolate – is actually the white/vanilla candy disks used when making you’re own candy (in molds) at home. Those are sold online or in Michael’s or cake/candy decorating stores. One minor thing, after I purchased starbuck’s box of 6 Bliss Bars to examine, I noticed that all edges had the blonde cookie base built up on all the edges. Hope this helps in pursuing the recipe as close as possible to the original. You’re totally right about ginger though. I like using the powder for the sake of convenience, since I never have the candied one and always have the powder. But, the candied ginger is the right one to use if you’re going for a more exact replica. Overall, my recipe was an attempt to replicate Cranberry Bliss Bars that Starbucks sold before they switched to the new bakery. The ones they sell now, are not the same as the ones they sold before. Hi! In the video what size is your pan? You mentioned that you’ve changed the recipe a little bit. (The directions still have a 9X13 pan) Also, do you keep the baking time the same for the smaller pan? In the video, I use a 11inX11in baking pan, which is the same by area as the 9×13. The baking time is the same as what I have in the recipe card. Thank you! Can’t wait to make this for thanksgiving! i love your bars!! 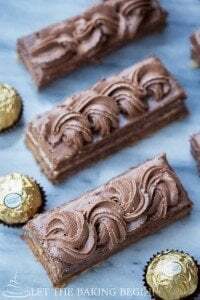 im making them for a party but need to double the recipe. i have a pan size 14×21. will that work? or should i do it in 2 pans 9×13? 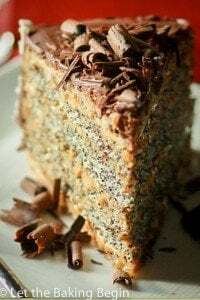 I would just do two 9×13 pan for this recipe. Hi Marina. Could not watch your video; aparantly my browser does not recognise any of the formats of the video. Pitty. But bars are looking amaising! Never tried them before; Starbucks here does not make them. Definitely will try. Yes. Just put them in a box with aid so they don’t take on the smells of the freezer. Copycat Starbucks Cranberry Bliss Bars - Let the Baking Begin! Good job, Marina! Посмотрела твоё видео и настроение сразу какое то Рождественское!